This industrial-use humidification system uses fog that does not wet anything it touches (Dry Fog*1). It is built to accommodate a wide range of demands and requirements. By controlling humidity either in large spaces or narrowly defined locations, it is possible to completely eliminate problems caused by static electricity. 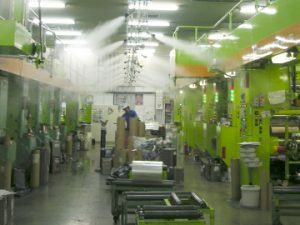 The running cost is 1/5 of a comparable steam humidification system, resulting in dramatic energy savings. This solution includes customer support on site investigation, layout design, installation work, and after-sales services. *1) We define Dry Fog as a very fine fog with a uniform mean droplet diameter (mean fog droplet size) of 10 μm or less. Because Dry Fog‘s exceedingly fine spray droplets remain intact without bursting when they come into contact with objects such as a walls and people, they do not wet these impact surfaces. “Dry mist“, despite its similar name, has much larger droplets than Dry Fog and has no specified droplet diameter as part of its definition. Dry mist droplet sizes vary significantly by producer and product. Energy saving: The running-costs of our system are only 1/5 of a typical steam humidification system, resulting in drastic energy savings.